Having a car is one of the most convenient things you can own or rent. The car will get you places without having to bother others for a ride. Plus, there's always a car out there to fit your needs, wants, and preferences. But car shopping is definitely a scary (first-time) or tedious (car dealerships are the worst) experience. Still, for most of us, it's going to happen at some point, so why not make it a little easier with these apps? 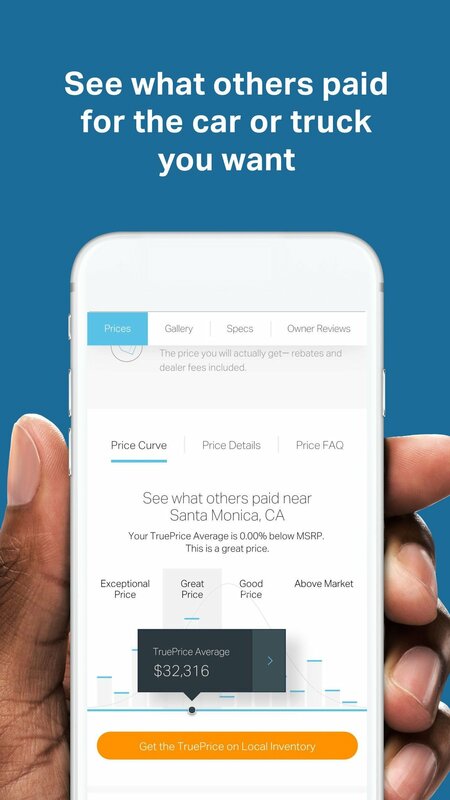 TrueCar is personally the app I used a few years ago when purchasing a new car. I like this one because you can get an upfront price before ever stepping foot in the dealership, and it also shows the average price that people have paid for the car you're looking at. TrueCar even gets you access to what a dealership has in stock right now, as well as the upfront price for those cars. Certified dealerships are obligated to honor the price you get in TrueCar, including all incentives you qualify for. Typically, the TrueCar user saves about $3300 off the manufacturer's MSRP, so you don't really lose when using this app. 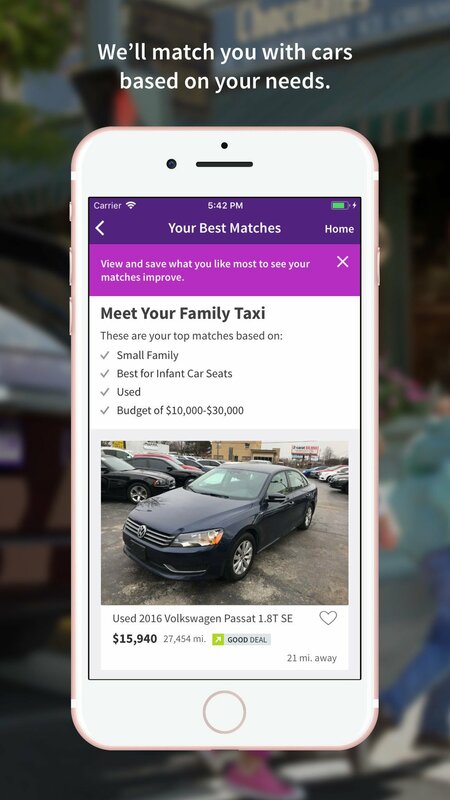 If you're specifically looking for used cars only, then this app is handy. Browse through four million car listings by making use of those filters. Get results by location, price, mileage, distance, date listed, height factors, and much more. The price for every car is also analyzed, so you can see if you're actually getting a good deal or if the seller is trying to price gouge you. 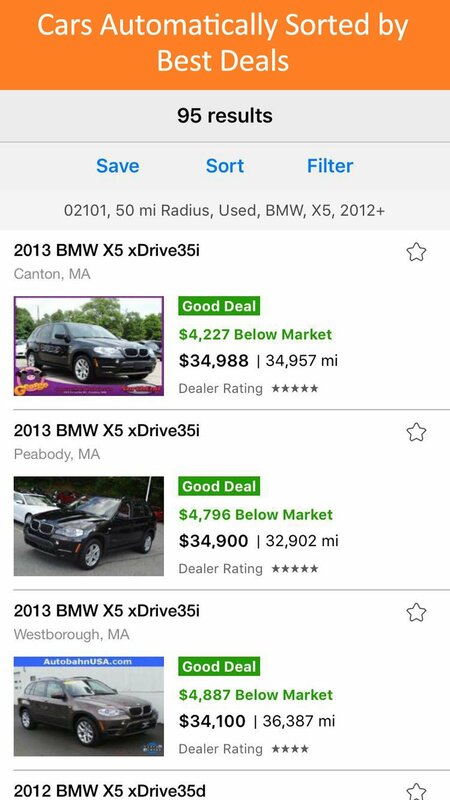 All of the dealerships that are listed in Used Car Search Pro are also objectively scored and rated, so you aren't getting ripped off. And finally, you can get notifications whenever a car you want gets a price drop or other important alerts. 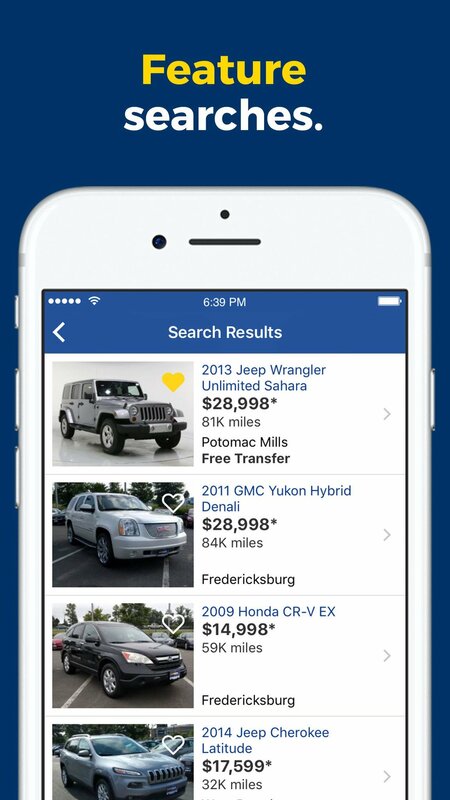 Another option for used cars is going to CarMax, and that's made easy with their official app. 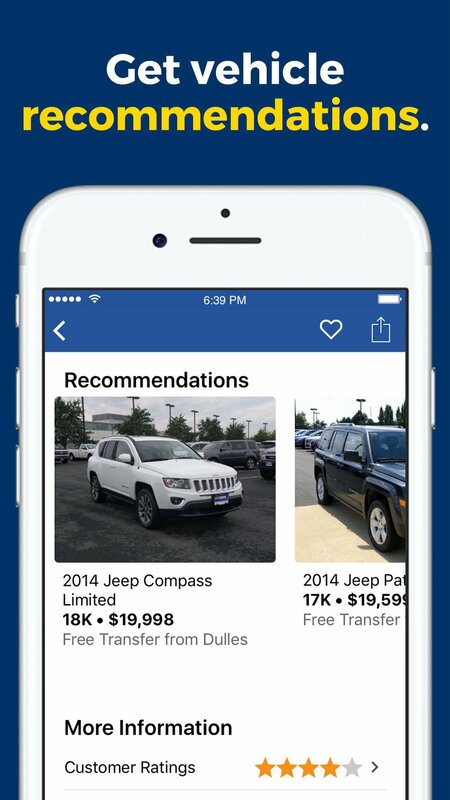 With the CarMax app, you can search for your perfect used car by features like 4WD/AWD, navigation, leather, MPG, and much more. CarMax always has a nice variety of cars at their dealerships, so you're bound to find one that suits your needs. 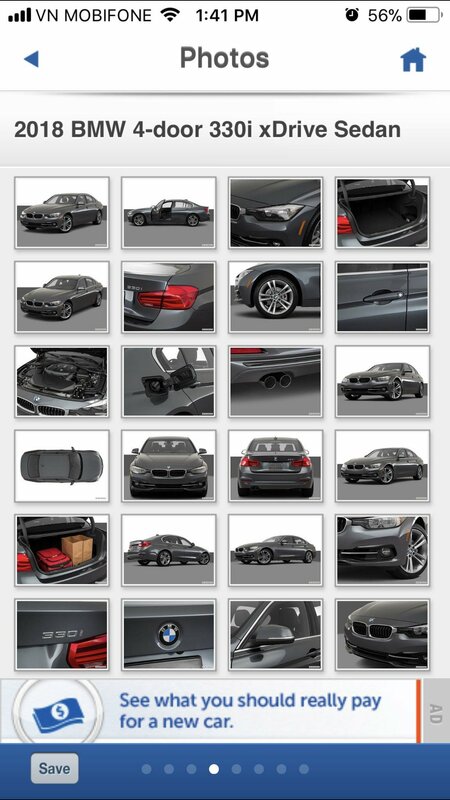 The app lets you view the car photos from the dealership and get full pricing information at your fingertips. 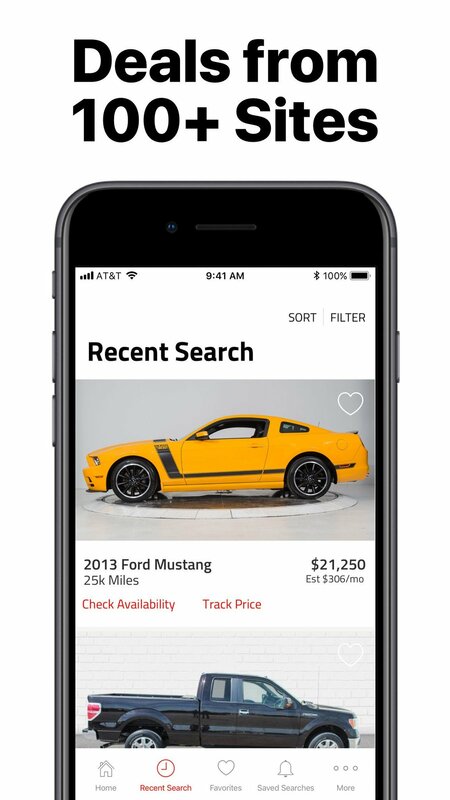 Save your searches, get full appraisal reports on cars you're interested in, get alerts for any changes, find recommendations, and even get pre-qualified right from the app. If you have a CarMax dealer near you, this may be a good way to go about obtaining your next car. With Autotrader, you're able to find the right car for you, no matter where you are or what you're looking for. Autotrader features listings of new, used, and certified pre-owned cars from your local area, and you can access a ton of detailed information about the ones that pique your interest. You'll get full car information, detailed pricing, and even vehicle history reports when applicable. You can also pull up car reviews for that particular model directly in the app, so you can be confident whether or not it's a good buy. 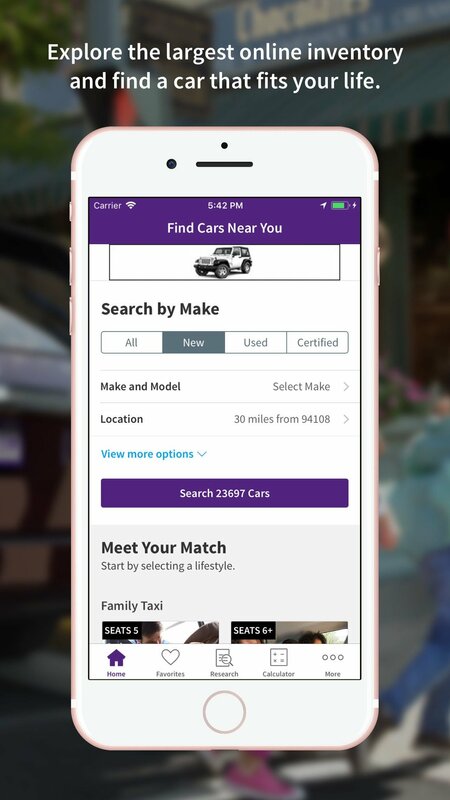 You can search for cars with a lot of different filters, save them, and get alerted whenever there's a new listing or change. And if you want to trade in your current car, Autotrader provides instant offers. Edmunds is a trusted car research site and car buying advisor for both consumers and the auto industry in general. 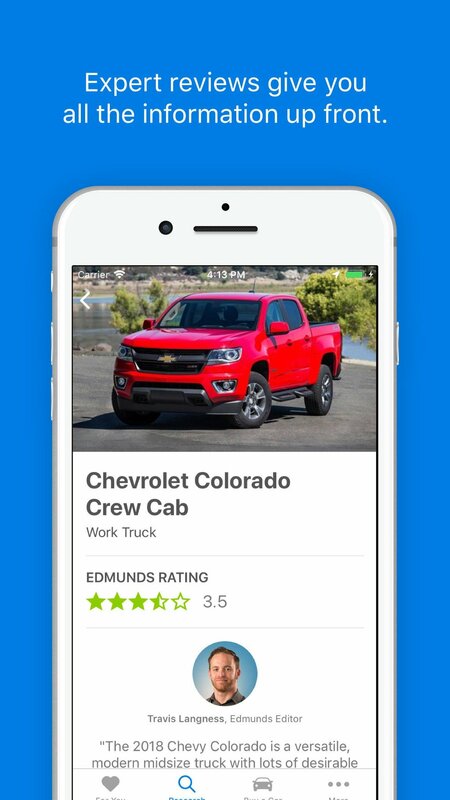 In the Edmunds app, you'll find the latest test drive videos for each car, as well as the reviews from the team along with user ratings for thousands of cars. You can search for your car from a variety of filters and search terms, and Edmunds offers both new and used cars. It even pulls up the inventory of dealerships, and you can get full market value information as well as the average price paid in the area. 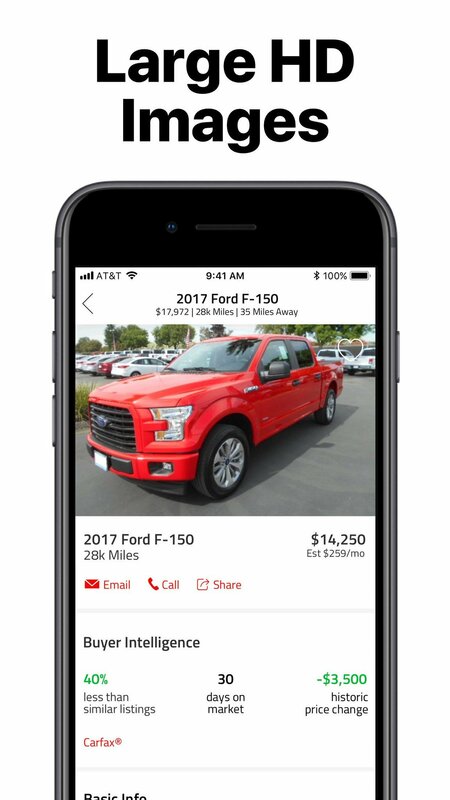 And since every dealer has their own offers, Edmunds allows you to compare their offers and qualifying incentives right from the app. This is a trusted source for a reason. When it comes to buying and selling cars, most of us are familiar with Kelley Blue Book. 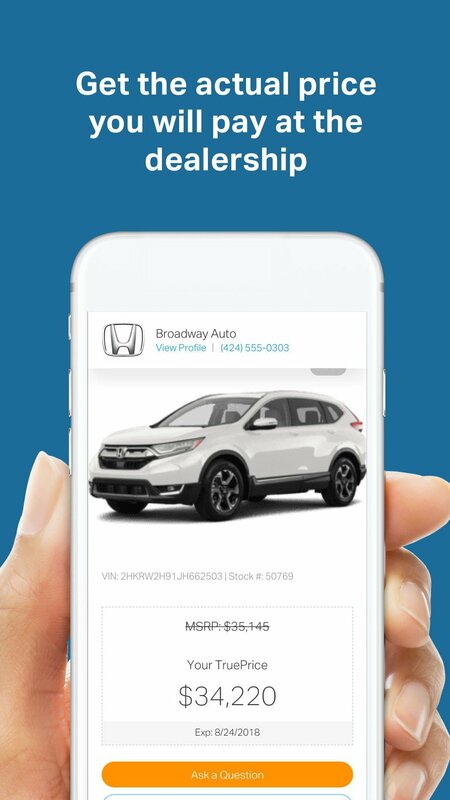 This simple app allows you to check the current value of your car so you can make sure you get the correct worth before trading it in or selling. 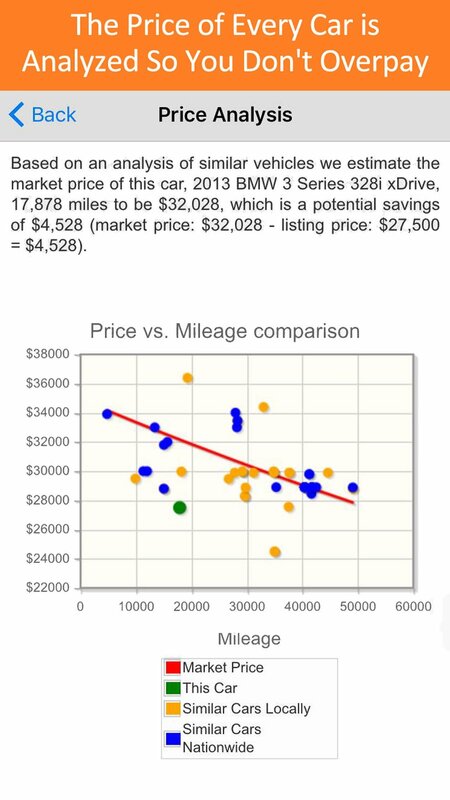 It also lets you check the prices for the next car you're interested in, and even compare a few models side-by-side. This app is barebones compared to the other apps, but it's still a valuable tool to have, especially if you're selling. Another expert source is Cars.com. With the official app, you can search for your next car with an extensive variety of filters, like color, transmission, fuel type, body style, and more. 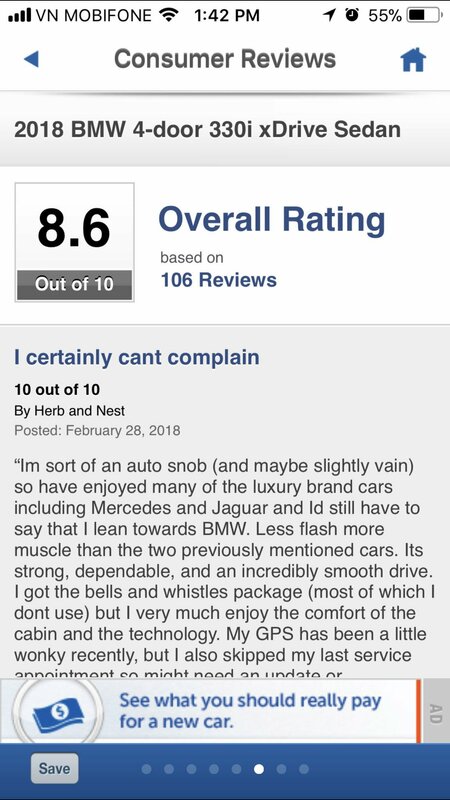 You'll find detailed pages for every car that's available, and you have access to the Cars.com editorial team reviews, along with user submitted reviews. 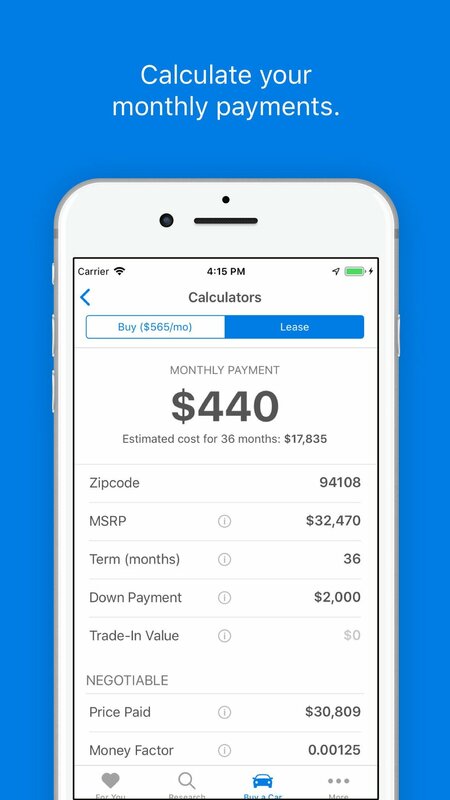 The payment calculator helps you figure out the monthly payments that you'll need to make, so you can also find out what you can really afford instead of being suckered into something by a car salesman. Cars.com even tells you what you should be paying for repairs once the car is bought, so you don't get ripped off. Autolist is designed for those who want a used car. You'll be able to browse the largest inventory of used cars from dealerships all over, and narrow it down to local results and of what you're seeking. 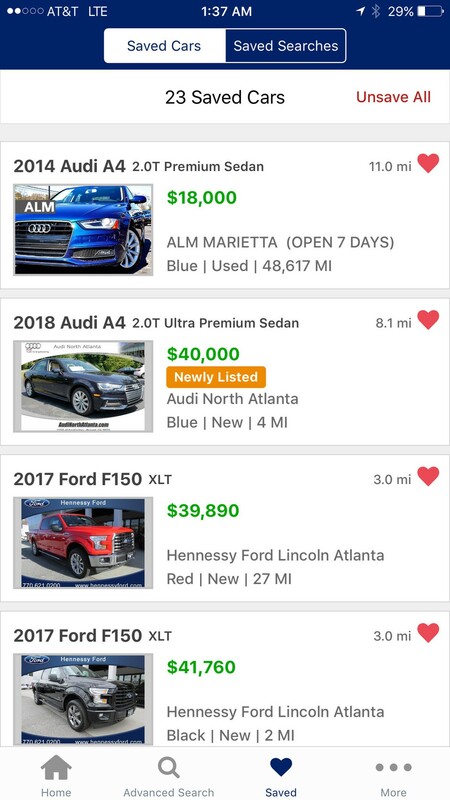 It's the largest inventory because Autolist aggregates all used car listings from several sources into one place, so it's all there. 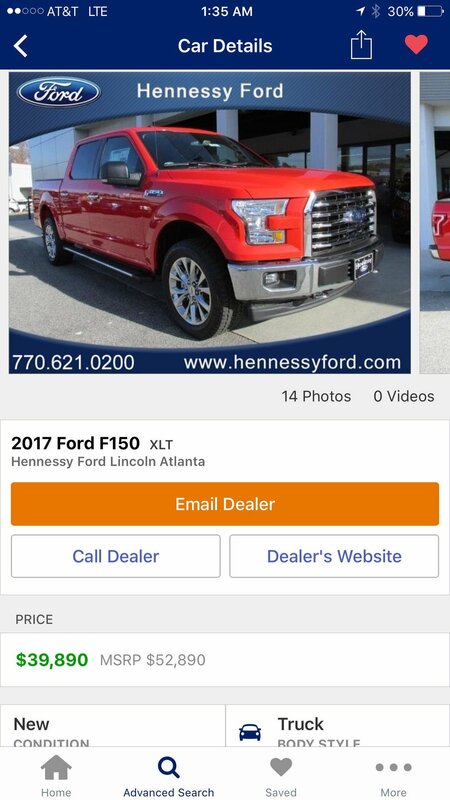 You're able to call, text, or email dealers directly regarding listings, get price quotes, and even schedule test drives, all within the app. Autolist even has a comprehensive price history for all cars, as well as Carfax reports for accident and service history. These are some of the best apps we know of when it comes to finding a new or used car from reputable private sellers and dealerships. I mean, you could also find something on Craigslist, but these apps help you get all the information you need and even tell you how much others have paid on average, so why not? Are you in the market for a new ride? What apps are you using? Let us know in the comments!